The lights sank and plunged the theatre into darkness. A man was brought into view, stage left and backlit in silhouette. Dressed all in black with a collar ruffle of feathers, he walked silently toward the grand piano at a glacial pace. He sat and played his new album, All Days Are Nights: Songs For Lulu, in entirety without pause or, as instructed by the announcer, a sound from the audience. Allowing this song cycle to run without interruption, filling the room with arpeggios, created a perhaps expected atmosphere. It was mourning. 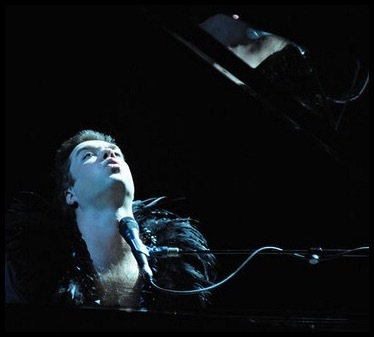 Rufus Wainwright, bowed by grief over the recent loss of his mother, played carefully and remained poised despite obvious nervousness. The stage stayed dark, save for a single spotlight over him. Flanked by scenery from his own opera, Prima Donna, playing currently, he weaved melodies from his own hand, Shakespeare’s sonnets and a French libretto. A ten-foot coat train draped behind him stretching half way across the stage, as the visuals of Douglas Gordon gently unfurled on a cinema size screen. Known for his Zidane: A 21st Century Portrait film, a real-time study of the graceful, balletic Frenchman playing for Real Madrid, he took film of Rufus’s eye, clad in make-up, black oils and a silver tipped false eyelash, and played the footage back in slow motion as the large eye, or several smaller ones, opened and closed. At the surprising end of his Zidane film, the master fights his way into a red card. As Rufus played the last song, Zebulon, a tale of an imaginary childhood friend returning to witness adulthood, a bulbous tear collected in the on screen eye and slowly made its journey, as tears do. I wiped my own tear, not for the last time in the evening, and took pause as he again slowly walked off as the curtain fell and the applause was finally allowed to rise. With a wonderful absurdity and a theatrical pretentiousness that somehow didn’t feel unwelcome, it was quite simply one of the finest and most moving performances I have seen. Recorded a month before Kate McGarrigle’s death in January, All Days Are Nights has inevitably taken on the role of songs mourning the end before it came. That he gets out there and plays these songs feels like part of the recovery process, with emotions open and raw. That’s always been the way in his family, gladly beholden to their folk tradition. Intimate feelings are poured into songs, be they complimentary or vicious. The song Martha exhorts his sister to take over the matriarch role, as something she must do, hers to make in her own image. Dinner At Eight, performed in the second half, is a devastating, sad tale of child abandonment and plea for remorse directed at their father Loudon. Now Kate has gone the healing of parental relations seems to have begun, with that song the last, you hope, of the most brutal of judgements. Coming out for the second half rather more modestly dressed, Rufus was visibly relaxed, performing songs of great beauty – The Art Teacher, Poses, Vibrate – for the assembled crowd. Always a bundle of nervous energy he riffed on the noticeable blue plaques in London, given to notable residents: “I need one of those… or a statue maybe!” He is a curious mix of extreme show-off and goofy joker, welcomed with great affection by his audience. Taking two encores, the setlist spanning all of his recorded work, he warned us that what was coming, The Walking Song, was by his mother and an example of her being the most talented of the family. It was beautiful and, since he has elected to perform it nightly, it brought the outcome one might expect: he made it almost to the end without breaking down but upon singing “We’ll talk blood and how we were bred, talk about the folks both living and dead” he could hold onto his concentration no longer and, with cracking voice, it rumbled to a quick halt. He stood, wiped tears from his face, and took a bow. One final note of brightness, the first song from his first album, Foolish Love, ended the proceedings. He pushes himself harder than ever at a time when he’s most vulnerable, inviting us to intrude on his grief. Public mourning is very often painful to witness, and it was, but one could not turn down the invitation of going on the journey.